This spring has been the time to SAY SOMETHING. FableVision founder Peter H. Reynolds was on an extended book tour with Scholastic in March to share his latest book, Say Something!, already a NY Times Best Seller. And while Peter encouraged us to Say Something, his new student publishing platform, Get Published!, gives students the tool to do just that! Your FREE gift from Peter is a downloadable Say Something activity. Print and share, to give students (and those who teach them) the chance to say what's on their minds! What will you say to make the world a better place? How do you leverage mood in storytelling? How do artists create storyboards? How do you animate a character turning 360 degrees? Miami-Dade County, one of the top five largest school districts in the US, explored these and other illuminating topics in our new Animation Career and Technical Education (CTE) pilot program for Middle Schools. In this program, students are exploring professional animation techniques using Animation-ish, a fun and intuitive animation program that has been included on the CAPE Digital Tools List by Florida's Department of Education. Miami Arts Studio 6-12 at Zelda Glazer Magnet Program. The schools will complete the customized curriculum this spring, with major expansion plans for the fall! FableVision Learning's sister company, FableVision Studios has received two Parents' Choice Gold Awards for their work on Project Here Games (created with Health Resources in Action, the GE Foundation, and the Massachusetts Attorney General Office) and The Water Princess (created with Weston Woods Studios). These two powerful projects deliver important messages to young audiences, addressing themes that range from ending substance abuse in teens to generating awareness of the clean water crisis. Congratulations to the team and their collaborators for this amazing honor! Through FableVision Learning's training programs, we are thrilled to share professional tips and guidance from Studio professionals with the next generation of aspiring storytellers, as they learn about the magic of "Stories that Matter, Stories that Move!" Video: Peter H. Reynolds Shares His Inspiration for Get Published! Get Published, our new student publishing platform, launched last month! The concept of the program is based on the classroom becoming a publishing company, with the teacher acting as Editor-in-Chief. The process of writing and editing a book is central to the experience. Through videos and activities, Peter guides students through the development of characters and storylines. The end result is an e-book or hard copy that students can proudly share. In this video, Peter explains his inspiration for creating this ground-breaking, interactive, and exciting program that introduces students to the joy of publishing books. We were thrilled to help The Deal School in NJ celebrate creativity! Though events that included a community night and a day of workshops, FableVision Learning's Director of Curriculum and Learning Dr. Denine Jimmerson shared best practices from around the country using Fab@School Maker Studio. CEO Paul Reynolds also joined by Skype to encourage students to Create Bravely. This message is conveyed in Going Places, a book by Paul and Peter H. Reynolds, and its precursor animation Above and Beyond, from FableVision and Partnership for 21st Century Skills. Image from Above & Beyond, a story about what is possible when communication, collaboration, critical thinking, and creativity take center stage in schools and transform learning opportunities for all kids, created by FableVision through collaboration with members of Partnership for 21st Century Skills. 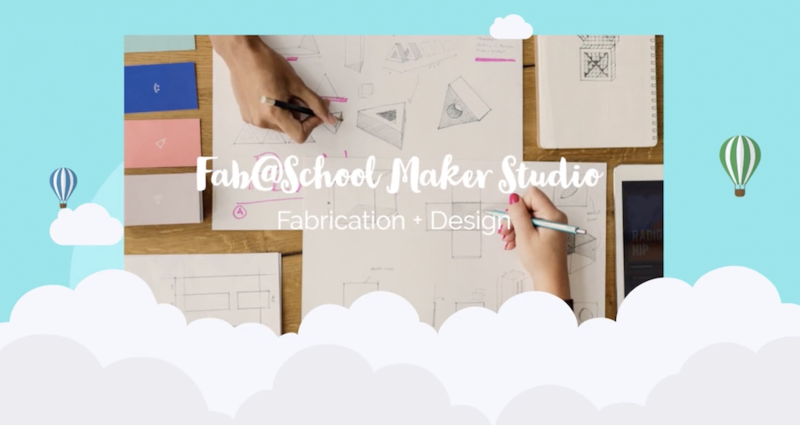 If you haven't heard about Fab@School Maker Studio, watch this short video! Users report that it is "the missing piece for their maker program," ensuring quick design within the class period and taking students from 2D to 3D thinking. New pricing means your whole school can have access for $675/year. School-wide pricing includes an online workshop, and 50 Math "Flash Tasks" to get you started! Celebrating Libraries, Games, and Playful Learning! This April, FableVision and the American University Game Lab will co-host the inaugural Libraries, Games, and Play Conference in Washington, DC. FableVision/Reynolds Center co-founder and CEO Paul Reynolds will provide the closing keynote, celebrating librarians and creative educators who are providing no-tech, low-tech, and high-tech tools and programs that support creativity and playful learning. FableVision Learning and the Reynolds Center for Teaching, Learning & Creativity will also showcase Fab@School Maker Studio, the award-winning digital design and fabrication software platform for young learners. Happy New Year! 2018 was an exciting year for FableVision Learning and we are looking forward to an amazing 2019.